Hyderabad: Telangana Public service Commission has released AGRICULTURAL EXTENSION OFFICER GRADE-II; TSPSC has announced recruitment notification for total 311 AGRICULTURE EXTENSION OFFICER GRADE-II IN DEPARTMENT OF AGRICULTURAL SUBORDINATE SERVICE, Agricultural Subordinate Services Board inviting the application for the eligible Telangana people to full fill the Agricultural Extension Officer vacancies. 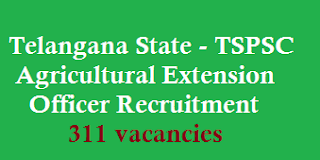 Candidates who want to apply for Post of Agricultural Extension Officer they should apply from ONLINE through TSPSC official commission’s website www.tspsc.gov.in, online Registration Starts from 31st Dec 2015 to 25th Jan 2016, candidates should apply before the closing date through online from commission’s official website. The Examination is likely to be held in the month of March-2016. The Commission reserves the right to conduct the Examination either COMPUTER BASED RECRUITMENT TEST (CBRT) or OFFLINE OMR based Examination of objective type. And Agricultural Extension officer Examination Hall Tickets Will downloads 7 days before the Examination from TSPSC Commissions’ website. 3) Diploma in Agriculture Polytechnic or Diploma in Agriculture Polytechnic (Seed Technology), (Plant Protection) and (Organic Farming). Note: - (1) The vacancies notified shall be filled with the candidates who possess the above qualifications in the ratio of 4:1:5 respectively out of every 10 vacancies.